Squawking Rubber Chicken! EAAKKK! Give the 18 inch rubber chicken a little squeeze and he'll shriek with surprise! 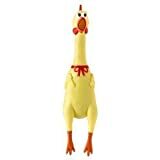 The squawking rubber Chicken comes with a comical look on its face ready to make some noise! Great joke or novelty gift!